Routine electroencephalogram (rEEG) is an important investigation in suspected seizures but can be normal in people with epilepsy. The diagnostic yield of rEEG varies considerably according to the patient group studied. We aimed to estimate the diagnostic yield of rEEG in a real-world cohort of adults with active epilepsy—a population not previously reported. This single centre study evaluated neurophysiology findings for adults with prolonged inpatient video EEG (vEEG)-confirmed active epilepsy, who had at least one prior rEEG. Sixty-eight patients had a total of 171 rEEGs, of which 93 (54.4%) were normal, 42 (24.6%) found non-specific abnormalities and 36 (21.1%) captured interictal epileptiform abnormalities (IIEAs). Serial rEEGs revealed a 22.1% yield of IIEAs on the first test, with the cumulative yield peaking at 33.8% on the fourth rEEG. This study adds to existing evidence regarding the limited diagnostic usefulness of serial rEEG in patients with active epilepsy. The diagnosis of epilepsy is generally established on clinical grounds but may be supported by EEG findings. Prolonged vEEG, usually performed as an inpatient on an epilepsy monitoring unit (EMU) over a period of days, is widely considered the ‘gold standard’ investigation in intractable seizures1. It captures both ictal and interictal activity for diagnostic clarification, seizure classification and the identification of epileptogenic cortex in focal epilepsy. It is resource intensive and access is limited in most regions of the UK and Ireland. rEEG is regarded as an important initial investigation in suspected epilepsy. It is typically carried out over 20-30 minutes on an outpatient basis and primarily aims to detect IIEAs, which are strongly associated with epilepsy. It is reported that IIEAs are present in 30-50% of rEEG recordings and that the cumulative yield increases on serial testing to 80-90% by the third rEEG1-4. If a single rEEG is normal, a sleep-deprived EEG may increase the yield of IIEAs by an additional 30% or more5-7. However, the diagnostic yield of rEEG varies considerably according to the population studied and most published data pertains to highly selected groups, such as people with a suspected first seizure or with drug-resistant temporal lobe epilepsy. rEEG can repeatedly fail to reveal IIEAs in some people with epilepsy. Among people who do not have epilepsy, rEEG can show non-specific abnormalities in 10% and epileptiform abnormalities in 2%8,9. EEG interpretation is subjective and considerable interobserver variability exists10,11. Misinterpretation and over-reading of EEG waveforms are thought to be underreported problems contributing to misdiagnosis12-15. Misdiagnosis and diagnostic delay contribute to poorer clinical outcomes in epilepsy. For these reasons, it can be challenging to determine the most appropriate method of EEG in day-to-day clinical practice. This study aims to retrospectively estimate the diagnostic yield of rEEG in a cohort of adults with EMU-confirmed epilepsy, and to evaluate the concordance of rEEG findings with vEEG data. All adults who underwent prolonged vEEG in the EMU at Cork University Hospital between January 2015 and August 2016 were screened, and those with a definite vEEG-established diagnosis of active epilepsy and at least one prior rEEG recording at the same centre were included. All patients provided informed written consent for study participation. Searches of the neurophysiology department database, medical charts and epilepsy clinic letters identified previous rEEGs, with findings classified as normal, IIEAs or non-specific abnormalities. rEEG recordings lasted 20 minutes, using the 21 scalp electrodes of the modified 10-20 International System, and included hyperventilation (3 minutes followed by up to 60 seconds to return to baseline) and photic stimulation as activation procedures. Patients were not sleep-deprived prior to rEEG and any sleep which occurred was unplanned. Recordings were screened by neurophysiology technicians and reported by a single consultant neurophysiologist. An identical scalp electrode setup was used in the EMU, where vEEG was undertaken by the same personnel and performed for 5-7 days under the clinical supervision of a consultant epileptologist and an epilepsy fellow, employing cumulative sleep-deprivation and anti-epileptic drug reduction as seizure-provocation measures. EMU nurses directly observed patients 24 hours per day, documented clinical details and timings of suspected seizures, performed standardised interactive ictal assessments for focal-onset events and ensured patient safety. vEEGs were screened in parallel by neurophysiology technicians and a single consultant neurophysiologist who was blind to clinical history. Data triangulation was facilitated by a multi-disciplinary team meeting between the clinical EMU team, the neurophysiology technicians and the consultant neurophysiologist before a final neurophysiology report was produced. Reports for rEEGs were compared to those of corresponding EMU vEEGs for concordance in terms of seizure lateralisation and localisation. If a patient’s vEEG concluded unilateral left temporal lobe epilepsy, a rEEG conclusion of unilateral right temporal lobe epilepsy was considered non-concordant on the grounds of lateralisation. However, if the rEEG for the same patient simply described independent bitemporal interictal epileptiform discharges without a specific conclusion, it was deemed concordant. One-hundred and twenty-two people underwent EMU vEEG in the specified period and 68 satisfied the inclusion criteria—38 (55.9%) females, mean age 39 years (median 34, range 17-71), mean vEEG duration 7 days (median 7, range 4-7) and number of prior rEEGs 171 (Table 1). Three (3.8%) people had epilepsy with coexisting psychogenic non-epileptic seizures (PNES). Overall, 36 (21.1%) rEEGs captured IIEAs, 42 (24.6%) had non-specific abnormalities and 93 (54.4%) were normal. Twenty-four (66.7%) rEEGs with IIEAs had neurophysiology reports concordant with vEEG findings. The remaining rEEGs with IIEAs had non-concordant reports on the grounds of lateralisation of epilepsy focus (5 rEEGs), localisation of epilepsy focus (2), both lateralisation and localisation of epilepsy focus (3), classification of focal epilepsy as generalised (1) and classification of generalised epilepsy as focal (1). 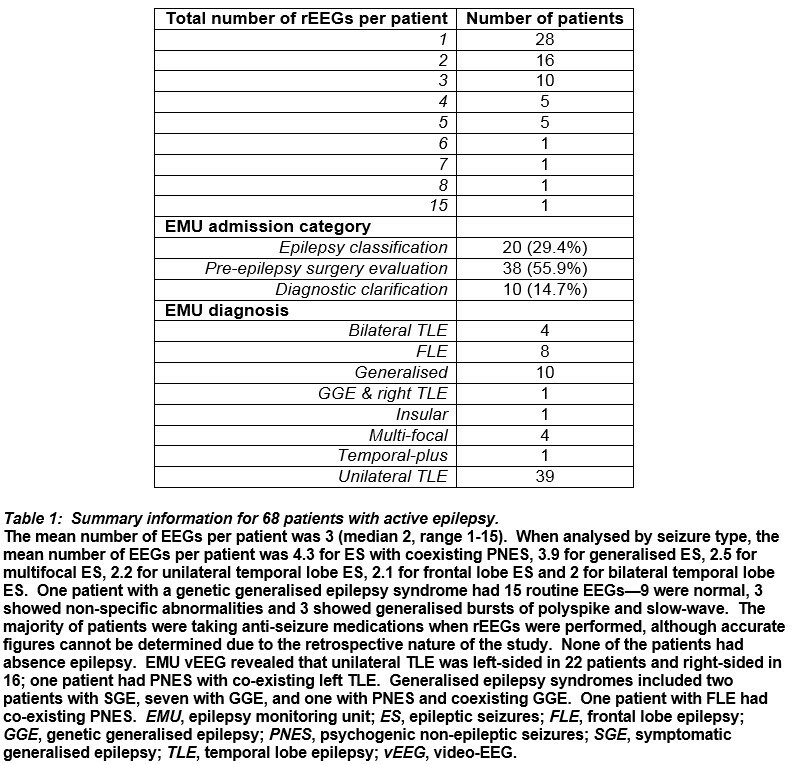 Patients with genetic generalised epilepsy syndromes had the greatest proportion of rEEGs identifying IIEAs, followed by those with bilateral temporal lobe epilepsy and multifocal epilepsy (Figure 1). Serial rEEG revealed a 22.1% yield of IIEAs on the first test and the cumulative yield peaked at 33.8% on the fourth (Figure 2A). When analysed by concordance with vEEG diagnoses, serial rEEG had an 11.8% yield of IIEAs on the first test, increasing cumulatively to 22.1% on the fourth (Figure 2B). 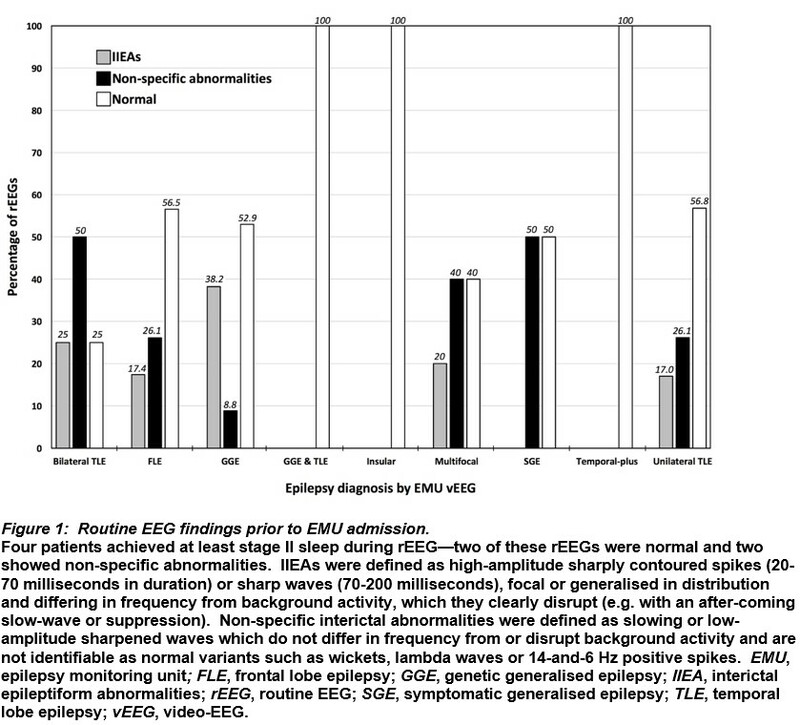 Thirty-three patients had tests with additional EEG modalities before EMU vEEG (Figure 3). Of 17 sleep-deprived EEGs, 7 (41.2%) demonstrated epileptiform abnormalities, 9 (52.9%) were normal and 1 (5.9%) had non-specific abnormalities. Of 37 previous video-EEG studies conducted in a general neurology ward setting (i.e. not in a supervised EMU), 25 (67.6%) found epileptiform abnormalities, 10 (27%) were normal and 2 (5.4%) showed non-specific abnormalities. rEEG was the method of EEG that captured the greatest number of both normal and non-specifically abnormal findings. Among the patients with proven active epilepsy in this study, the yield of IIEAs on rEEG was considerably lower than the 30-50% figure commonly quoted in the literature. Yet most people had highly active epilepsy and intuitively might be expected to have more IIEAs evident. This discrepancy may be partly explained by more conservative reading in a specialist epilepsy centre and the low rate of incidental sleep during rEEG in our cohort. The heterogeneous, real-world case mix and the high proportion of more complex epilepsy (i.e. bilateral temporal lobe, frontal lobe, multifocal, and genetic generalised with coexisting focal epilepsy accounted for one quarter of the cohort) could arguably be associated with more unusual, less consistent or less frequent EEG abnormalities than those typically reported in EEG cohorts. Patients with the same underlying pathology (e.g. hippocampal sclerosis) can have differing frequencies of EEG abnormalities, and some can have relatively few interictal spikes or instances of focal slowing, even on EMU recordings. It is possible that some patients had rEEG performed early in the clinical course, with epilepsy becoming more active (‘kindled’) by the time of EMU admission. Twelve (7.0%) of all 171 rEEG conclusions were potentially misleading, in that they were non-concordant with subsequent vEEG diagnoses. However, concordance is unlikely to be clinically relevant in the early stages of most cases of focal epilepsy if the mismatch concerns laterality or localisation of IIEAs, as the key clinical outcome (i.e. identification of focal epilepsy requiring anti-epileptic drug therapy) is unaffected. The relationship between IIEAs and ictal activity is not fully understood, and bilateral or contralateral IIEAs can occur with unilateral seizure foci16. Although an analysis of anterior temporal lobectomy candidates with mesial temporal sclerosis estimated concordance between rEEG IIEAs and the side of surgery at almost 90%2, it is possible that IIEAs captured within the narrow window of an rEEG could occur outside of the epileptogenic zone and provide seemingly misleading information regarding lateralisation or localisation. Labelling focal epilepsy as a generalised epilepsy syndrome and vice versa could potentially have adverse clinical consequences affecting prognostic information delivered, drug selection and time to epilepsy surgery17-19. Generalised epileptiform discharges on EEG may have focal features, and focal discharges with rapid secondary generalisation can be difficult to distinguish from primary generalised waveforms20. The importance or relevance of potential EEG abnormalities on shorter EEG recordings can be more difficult to judge compared to longer EMU recordings, where abnormalities may be recurrent and become more obviously abnormal with sleep-deprivation and anti-epileptic drug withdrawal. Focal slowing on EEG can be a useful predictor of focal epilepsy and was classified in this study as a non-specific abnormality. Of seven (4.1%) rEEGs with focal slowing as the only abnormality, the corresponding patients all had unilateral temporal lobe epilepsy—the focal slowing on rEEG occurred in the contralateral hemisphere to the EMU-established epileptic focus in two patients, in the ipsilateral hemisphere (but without subregional localisation) in two, and in the same location in three individuals. As this was a retrospective naturalistic evaluation, there was no independent validation of EEG reading or blinding to clinical history, and no estimation of interobserver variability. An awareness of clinical information may influence EEG interpretation (e.g. non-specific abnormalities may be more likely to be viewed as epileptiform if there is a strong family history of epilepsy). It was not possible to control the number of rEEG recordings for each patient, anti-seizure medication status, seizure-to-rEEG interval or inter-rEEG period. It is difficult to draw firm conclusions from the different patterns of referral for the various EEG methodologies, as clinical care was directed by multiple physicians and neurologists, and was not standardised. Limited access to vEEG monitoring might have influenced the choice of investigations. While it may not be possible to obtain a definitive diagnosis in all circumstances without conducting prolonged EMU vEEG, modifications in the techniques for other forms of EEG may facilitate earlier diagnosis in some patients, potentially reducing diagnostic delay and making more efficient use of resources. For example, the timing of EEG is important and rEEG is commonly recommended within 24-48 hours of a suspected first seizure6,21. The longer the duration of EEG recording, the greater the sampling time and the more likely abnormalities are to be captured. Sleep-deprivation, independent of whether sleep itself occurs during EEG recording, considerably increases the yield of EEG22 and the observed yield in this study was greater in the subgroup of epilepsy patients who had sleep-deprived EEGs. Testing for reflex epilepsy traits, such as pattern sensitivity or praxis induction, can aid identification of epilepsy23 and extending the period of hyperventilation during rEEG can be clinically useful24. Practice in some centres following a normal rEEG is to perform a sleep-deprived EEG, and to then arrange prolonged vEEG if required. Where available, ambulatory prolonged vEEG may be a further option to consider prior to EMU vEEG. In conclusion, the low yield of serial rEEG in this heterogeneous real-world case mix, together with the high rate of normal and non-specific abnormalities, does not support routinely repeating multiple rEEGs after a normal test. 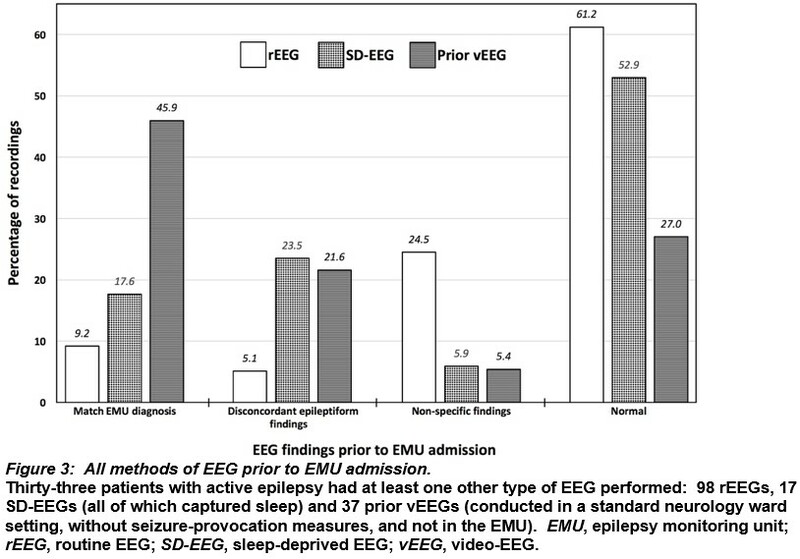 Greater use of sleep-deprived EEG and EMU vEEG may be more cost-effective. A small minority of epilepsy patients had a clinically-significant change in diagnosis following vEEG monitoring—this raises the possibility of EEG misinterpretation, which is thought to be an underreported issue that is important to recognise in order to optimise the quality of healthcare delivered. The authors confirm that they have no conflict of interest to declare in relation to this work. 1. Benbadis SR. What type of EEG (or EEG-video) does your patient need? Expert review of neurotherapeutics. 2015;15(5):461-4. 2. Dericioglu N, Colpak AI, Ciger A, Saygi S. The yield of preoperative sequential routine scalp EEGs in patients who underwent anterior temporal lobectomy for mesial temporal sclerosis. Clinical EEG and neuroscience. 2010;41(3):166-9. 3. Salinsky M, Kanter R, Dasheiff RM. 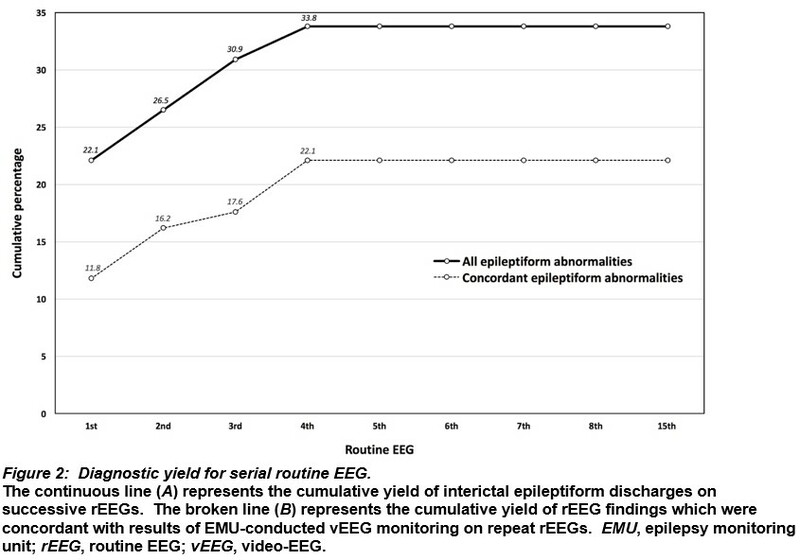 Effectiveness of multiple EEGs in supporting the diagnosis of epilepsy: an operational curve. Epilepsia. 1987;28(4):331-4. 4. Baldin E, Hauser WA, Buchhalter JR, Hesdorffer DC, Ottman R. Yield of epileptiform electroencephalogram abnormalities in incident unprovoked seizures: a population-based study. Epilepsia. 2014;55(9):1389-98. 5. Leach JP, Stephen LJ, Salveta C, Brodie MJ. Which electroencephalography (EEG) for epilepsy? The relative usefulness of different EEG protocols in patients with possible epilepsy. Journal of neurology, neurosurgery, and psychiatry. 2006;77(9):1040-2. 6. King MA, Newton MR, Jackson GD, Fitt GJ, Mitchell LA, Silvapulle MJ, Berkovic SF. Epileptology of the first-seizure presentation: a clinical, electroencephalographic, and magnetic resonance imaging study of 300 consecutive patients. Lancet (London, England). 1998;352(9133):1007-11. 7. Mendez OE, Brenner RP. Increasing the yield of EEG. Journal of clinical neurophysiology : official publication of the American Electroencephalographic Society. 2006;23(4):282-93. 8. So EL. Interictal epileptiform discharges in persons without a history of seizures: what do they mean? Journal of clinical neurophysiology : official publication of the American Electroencephalographic Society. 2010;27(4):229-38. 9. Reuber M, Fernandez G, Bauer J, Singh DD, Elger CE. Interictal EEG abnormalities in patients with psychogenic nonepileptic seizures. Epilepsia. 2002;43(9):1013-20. 10. Haut SR, Berg AT, Shinnar S, Cohen HW, Bazil CW, Sperling MR, Langfitt JT, Pacia SV, Walczak TS, Spencer SS. Interrater reliability among epilepsy centers: multicenter study of epilepsy surgery. Epilepsia. 2002;43(11):1396-401. 11. Williams GW, Luders HO, Brickner A, Goormastic M, Klass DW. Interobserver variability in EEG interpretation. Neurology. 1985;35(12):1714-9. 12. Benbadis SR, Tatum WO. Overintepretation of EEGs and misdiagnosis of epilepsy. Journal of clinical neurophysiology : official publication of the American Electroencephalographic Society. 2003;20(1):42-4. 13. Benbadis SR. Misdiagnosis of epilepsy due to errors in EEG interpretation. Practical neurology. 2007;7(5):323-5. 14. Benbadis SR. The tragedy of over-read EEGs and wrong diagnoses of epilepsy. Expert review of neurotherapeutics. 2010;10(3):343. 15. Krauss GL, Abdallah A, Lesser R, Thompson RE, Niedermeyer E. Clinical and EEG features of patients with EEG wicket rhythms misdiagnosed with epilepsy. Neurology. 2005;64(11):1879-83. 16. Serles W, Pataraia E, Bacher J, Olbrich A, Aull S, Lehrner J, Leutmezer F, Deecke L, Baumgartner C. Clinical seizure lateralization in mesial temporal lobe epilepsy: differences between patients with unitemporal and bitemporal interictal spikes. Neurology. 1998;50(3):742-7. 17. Wirrell EC. Prognostic significance of interictal epileptiform discharges in newly diagnosed seizure disorders. Journal of clinical neurophysiology : official publication of the American Electroencephalographic Society. 2010;27(4):239-48. 18. Chong DJ, Lerman AM. Practice Update: Review of Anticonvulsant Therapy. Current neurology and neuroscience reports. 2016;16(4):39. 19. Jette N, Sander JW, Keezer MR. Surgical treatment for epilepsy: the potential gap between evidence and practice. The Lancet Neurology. 2016;15(9):982-94. 20. Blume WT, Pillay N. Electrographic and clinical correlates of secondary bilateral synchrony. Epilepsia. 1985;26(6):636-41. 21. Pohlmann-Eden B, Beghi E, Camfield C, Camfield P. The first seizure and its management in adults and children. BMJ (Clinical research ed). 2006;332(7537):339-42. 22. Fountain NB, Kim JS, Lee SI. Sleep deprivation activates epileptiform discharges independent of the activating effects of sleep. Journal of clinical neurophysiology : official publication of the American Electroencephalographic Society. 1998;15(1):69-75. 23. Wolf P. Reflex epileptic mechanisms in humans: Lessons about natural ictogenesis. Epilepsy & behavior : E&B. 2015. 24. Craciun L, Varga ET, Mindruta I, Meritam P, Horvath Z, Terney D, Gardella E, Alving J, Vecsei L, Beniczky S. Diagnostic yield of five minutes compared to three minutes hyperventilation during electroencephalography. Seizure. 2015;30:90-2.